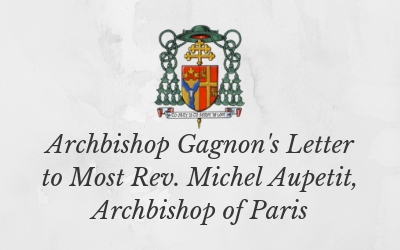 Archdiocese of Winnipeg - Archbishop Richard Gagnon recently wrote a letter addressed to the Most Reverend Michel Aupetit, Archbishop of Paris, the Archdiocese of Paris, and the people of France. Click here to view the letters in French and English. Ottawa, Canada - The President of the Canadian Conference of Catholic Bishops, Bishop Lionel Gendron, P.S.S. of the diocese of Saint-Jean-Longueuil, wrote a letter of prayer and solidarity addressed to the Archbishop of Paris, the Most Rev. Michel Aupetit, following the Notre-Dame Cathedral fire of April 15, 2019. Please click here to read the letter. Archdiocese of Winnipeg - Our local church's annual celebration of the Chrism Mass was held at St. Mary's Cathedral on April 15, 2019. The church was filled with representatives from throughout the Archdiocese who received sacred oils on behalf of their parish community or institutions. "...I am asking each Deanery and every parish in the Archdiocese to consider ways of implementing Global Initiative #3, namely: 'We encourage all the Baptized to acquire familiarity with Sacred Scripture.' It became very clear in our many Listening Sessions that the People of God in our Archdiocese are very concerned about our spiritual formation, and Holy Scripture is key in this..."